SWR Barroselas Metalfest 2017 will take place in Barroselas, Portugal on April 28-30, 2017. Mayhem, Venom Inc. and Aborted are among the bands that will perform at SWR Barroselas Metalfest 2017 festival. Inferno Metal Festival 2015 will take place in Oslo, Norway on April 1-4, 2015. Arcturus, Bloodbath and 1349 are among the bands that will perform at the Inferno Metal Festival 2015 festival. Muskelrock will take place in Tyrolen, Sweden on Thursday, May 31, 2012 at 4:00pm – Sunday, June 3, 2012 at 2:00am. Hell, M-Pire of Evil and Enforcer are among the bands that will perform at the Muskelrock 2012 festival. Live Evil Festival Part 2 will take place at The Underworld in Camden on Saturday 22nd & Sunday 23rd October 2011. 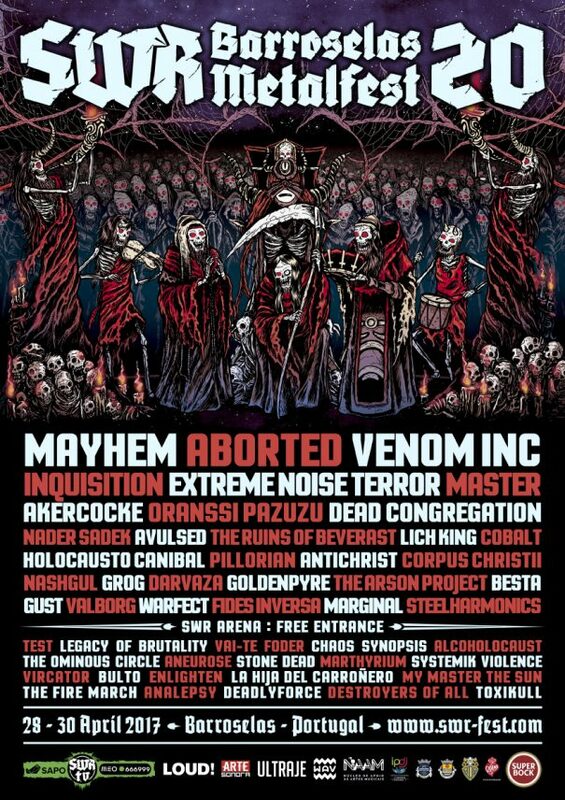 Live Evil Festival is an International Heavy Metal Festival presenting underground Black metal, Thrash, Speed, Death, Heavy Metal, Metal Punk and Doom bands from around the world. The bands who play it are picked by Fenriz and taken from his Darkthrone ‘Band of the Week’ blog. The festival remains 100% committed to the bands who play it. Muskelrock will be held in in Tyrolen, situated in a small village called Blädinge, 7km from the small town Alvesta, Sweden on June 2-4, 2011. Pentagram, Girlschool and Blaze Bayley are among the bands that will perform at the Muskelrock 2011 festival. Steelwing, Bullet and Slingblade are among the bands that will perform at the Muskelrock festival held in Tyrolen, situated in a small village called Blädinge, 7km from the small town Alvesta, Sweden on June 4-5, 2010. MUSKELROCK is a new heavy metal festival in southern Sweden, only 200km from Malmo. Its on a great venue from the sixties called Tyrolen, situated in a small village called Blädinge, 7km from the small town Alvesta.